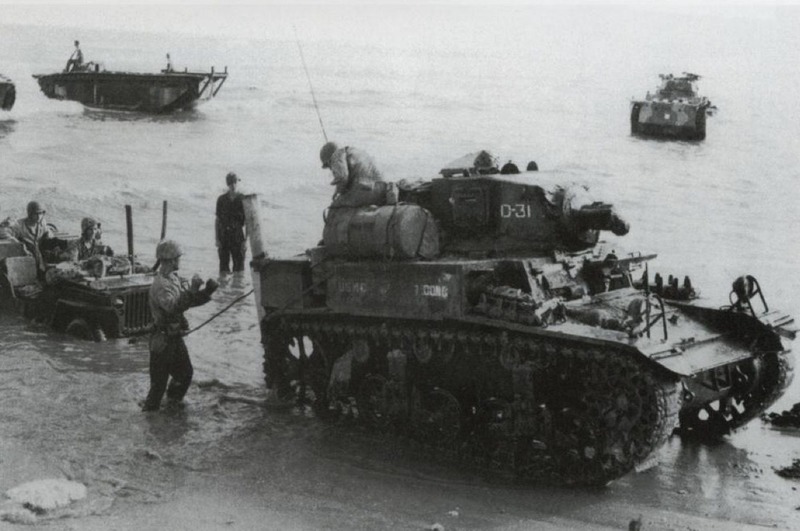 By mid-1943, light tanks – namely the M3 – had proven to be redundant in the Pacific theatre. Their small size was ill-suited to the harsh terrain, and their limited firepower put them at great risk of being overrun by Japanese infantry. The tanks would find a second wind, however. 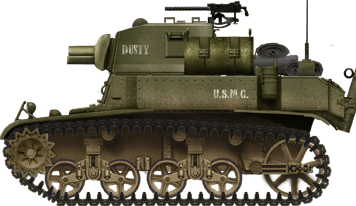 Starting life as a field expedient, the M3A1 Satan was one of the first flame thrower tanks the United States Marine Corps (USMC) had in their inventory. Built on the chassis of these redundant light tanks, specifically M3A1s, the Satan was also one of the first flame tanks the Marines were able to field during the Pacific Campaign of World War II, with its first deployment coming mid-1944. The M3 was the standard Light Tank in American service, replacing the earlier M2. 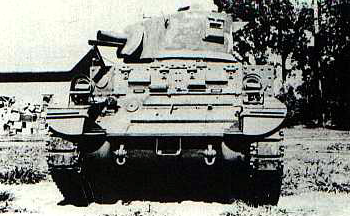 The M3A1 model was introduced in May 1942 and featured some changes from the standard M3 model. The A1 featured the same 220 hp Twin Cadillac Series 42 engine and Vertical Volute Spring Suspension (VVSS). It also retained the same 37mm (1.4”) M6 Tank Gun supplied with Armor Piercing (AP), High Explosive (HE) and Canister Rounds. The A1 came with an improved turret design which including the addition of a turret basket, which the early model was without. It also had a higher M20 AA mount for a Browning M1919 .30 Cal. (7.62 mm) Machine gun. This negated the need for the sponson mounted Browning machine guns found on the original M3. As such they were removed, the three remaining Brownings (bow, coaxial, AA mount) being judged sufficient for the task. The tanks were used extensively by the US Marines in the Pacific up to mid-1943 when they were beginning to fall out of favor with the troops due to reasons already discussed above. More medium tanks such as the M4A2 Sherman started to become available to the Marine Corps, and as such, these tanks started to take precedence. Japanese concrete bunkers were the bane of the US Marines in their island hopping battles of the Pacific. Often these bunkers were upwards of two-feet (24 inches) thick. The 37mm (1.4”) gun of the M3 and even the 75mm (2.95”) gun of the M4 could barely scratch these structures. As such, thoughts turned to attacking them with flamethrowers. Prior to the arrival of flamethrower equipped tanks, the Marines in the Pacific had relied upon the US Army’s M1A1 infantry flamethrower. The tactic would be to get as close to the bunker as possible and spray the flame into the openings of the bunker. The M1A1 required close quarters operation, however, as the weapon had an extremely short range. The operator was also vulnerable. Apart from the obvious risks of carrying highly flammable liquid on his back in a war zone, the gear was heavy. This made the operator sluggish and top heavy; an easy target. In early 1943, after the grim experiences of Guadalcanal, both the US Army and Marine Corps began drawing up plans to somehow mount the M1A1 flame equipment on the M3 Light tank. The first attempt was to simply fire the M1A1 through the pistol port of the M3’s turret, this was far from ideal as it gave a limited field of fire. This led to the idea of mounting the flame projector in place of the bow machine gun. This setup also allowed 2 additional units of flamethrower fuel to be carried in internal tanks. The first action for this configuration was by B Company, 1st Tank Battalion during the fighting on the Arawe Peninsula in support of infantry from the Army’s 112th Cavalry. A M3A1 equipped with M1A1 flamethrower attacked a Japanese bunker that was suppressing the attacking infantry. The flamethrower operator succeeded in spraying the liquid through the bunker openings. However, the fuel failed to ignite, which led to an extremely brave action from the operator in which he opened his hatch and threw a thermite grenade onto the fuel. This promptly ignited the fuel, putting the bunker and its defenders out of action. These type of flame tanks were also used by the Army along Torokina river on Bougainville, early 1944. Conscious of these improvised M1A1 mountings, both the Army and Marine Corps technicians in the Central Pacific attempted their own versions. The Honolulu Iron Works developed an enlarged fuel tank to increase the flamethrower’s capacity and extend the amount of flame it can produce. They were mounted on M3 Light Tanks, as well as LVT “Amtracs”. The first, rather unsuccessful action that these vehicles took part in was during the fighting on the island of Kwajalein in early 1944. The vehicles ran into numerous problems, including salt damage to the projectors from the sea water causing failures in fuel ignition. Despite this, the Marines operated at least one of these vehicles as part of their 4th Tank Battalion in the fighting on Roi-Namur. The overall inadequate performance of the improvised flame throwers led the Marine Corps and Army to look elsewhere for a flamethrower system that could replace the main armament of a Tank. The flame equipment they chose was the Canadian built Ronson F.U.L Mk. IV. Ronson flamethrowers were first developed by the British Petroleum Warfare Department in 1940. The British abandoned work on the weapons, however, judging them to have insufficient range. The Canadians continued work on the equipment and were able to make it more effective. They even mounted it on the Wasp Mk. IIC, a flamethrower variant of the famous Universal Carrier. About 40 Ronsons were shipped to the Central Pacific early in 1944 after they were requested by the famous Lieutenant General Holland ‘Howling Mad’ Smith, of the V Amphibious Corps. Here they took part in demonstrations for the heads of the respective services. So impressed was ‘Howling Mad’ Smith, that he approved the equipment. The Ronson was mounted in the turret of the mothballed obsolete M3A1s. To mount the weapon, the 37mm gun main armament was removed. The mantlet was retained, but a wide tube was introduced into the void left by the absent gun barrel to protect the flame projector. The coaxial machine gun was retained on the right of the flame aperture, though some vehicles did have their bow machine guns deleted. On the inside of the tank, a huge 170-gallon fuel tank was introduced to give the weapon as much burn time as possible. The projector had a range of up to 80 yards. This conversion had an unfortunate side effect. The piping connected the projector to the fuel tank limited the turret traverse to 180 degrees left and right. The M3A1 Satan was born. In total, 24 of these improvised flamethrower tanks were produced by Army and Navy mechanics on Hawaii in time for the Marianas operations. These new tanks were formed into dedicated flame thrower companies in the Marines’ 2nd and 4th Tank Battalions. The vehicles were shared between the two battalions, with 12 Satans each. The battalions also received three new M5A1 light tanks each, to provide gunnery support for the flamethrowers. The Satans saw their first action on the 15th of June 1944, during the landings on Saipan. The tanks were seldom deployed all at once, often being fielded four tanks at a time with gunnery support from one M5A1. Unfortunately, Marine commanders were not well versed in the concept of flame tanks, and as such the Satan was probably not used as much as it could have been. After the bitter fighting of the initial days of the assault, the commanders soon learned of the Satans effect. 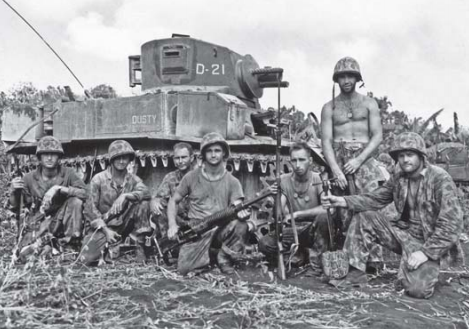 They were used in great numbers clearing Japanese cave-defenses and ‘mop-up’ operations, until the declaration that Saipan was secured, on the 9th of July 1944. Two Satan companies were then deployed on Saipan’s neighboring island, Tinian. Satans saw extensive use on this island as its terrain was far more compatible with tank operations. Only one Satan, belonging to the Marine’s 4th Tank battalion was lost after it struck a mine. More were damaged, but repairable. The Marines developed a standard operating procedure when attacking Japanese bunkers or cave defenses. Supporting M4A2s would crack open the bunker with round after round of High-Explosive, the Satan would then hose the area with flame followed by infantry assault squads that finish the job. A similar technique was employed by British troops in the ETO. Flame-throwing Churchill Crocodiles would often operate closely with the bunker-busting mortar armed Churchill AVREs. The AVRE would crack open a bunker, followed by the Crocodile hosing the breached area. The flaming liquid would then flow inside. The overall capability of the Satan became questionable, however, even after the victories on Saipan and Tinian. A number of issues were highlighted; unreliability, poor projection range, a poor arc of fire, faults with the electrical ignition system, cramped crew conditions. 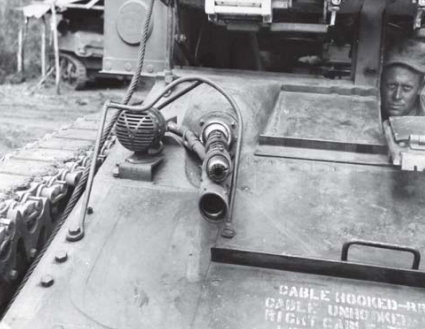 Coordination with infantry, a key part of Marine Tank tactics, was also hampered with the Satan as the radio was mounted in the right sponson, behind the flamethrower equipment. The Satan demonstrated to Marine and Army heads the versatility of flamethrower tanks in the Pacific Campaign, but in this form, it was not tactically sound. As such, work would begin on finding a replacement for this improvised vehicle. With lessons learned, the Satan would soon be replaced by Flamethrowers based on the M4A2, though there was a variant based on the newer M5A1 Light Tank, known as the E7-7 Mechanised Flamethrower. This was very similar to the Satan conversion of the M3A1. Two options were available for the M4 based projects. The E4-5 ‘Auxiliary’ flamethrower, and the ‘primary’ POA-CWS-H1 (Pacific Operations Area-Chemical Warfare Section-Hawaii-1). Auxiliary flamethrowers were so called because they supplemented the tanks existing main armament; the Primary type replaced the main armament completely. M4s equipped with such flamethrower would serve the Marines with great effect until the end of the war, playing important parts in the Battles of Iwo Jima and Okinawa. No Satans seem to have survived the war. None are known to still exist at the time of this article’s writing. Gern Ihre super Infos in Deutsch. Danke. I feel like the M3A1 satan would have been somewhat vulnerable on the battlefield to many japanese anti-tank weaponry, such as the Type 1 47mm AT gun and many other japanese AT weapons. I feel like Shermans would have been a better initial choice for a flamethrower platform due to many reasons. First the M4 would be capable of carrying far more fuel for the flamethrower, allowing for less frequent fuel re-supply. Secondly The M4 would have been almost invincible against almost all IJA AT weapons. I think that the M4 would have been a better initial platform for a flame throwing vehicle because of it’s superior survivability on the battlefield and it’s logistical simplicity. M4 based flamethrowers succeeded the Satan for almost all of the reasons you highlight. At the time, however, the USMC did not have enough M4s to spare for such experiments and conversions, so the obsolete M3s were chosen. Very interesting. Satan, crocodile, great names.